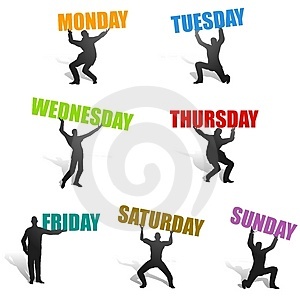 Question: If given an option for an eight day week, which day, out of all in a week would you want to repeat? The Friday morning is a happy morning, you wait for the day to end and facebook status reads TGIF.. No hard work today and all the tasks get dragged for the weekend... You stay up till late night, watch a movie or too.. chit chat with friends and make plans for the weekend.. the weekend celebrations begin from friday night. Saturday morning is when you realize how messed-up your room is. Everything that you have used during the week is lying next to your bed, on the table and in your bags, the wardrobe is all in a state of dizzy...You realize that if you have managed things better, if you kept every stuff at a proper place, than life would be easier. On a Sunday you find time out of busy shopping schedule, catching up with friends, meeting the grand mom, doing the weekend grooming and et al... Sunday evenings when you have a face-pack on, you start arranging the messed-up stuff in your room. You are tired, but you have decided that you will cut the clutter and clean it up. The morning blues experienced on the Monday, take a backseat as you feel good about you clean and organised room. You get up and get ready for work. Since you had already decided what to wear, you don't messu the with wardrobe and the undecisiveness. For the day, you bid a good bye to your room, you tell it that you will miss it and you love it the most in this world. In the evening you open the door and see it all neat and clean. The feeling is very similar to the feeling a day before is when Tuesday's sun knock from the window. During the day, you are told that have to get some documents, and you remember that you had seen it and kept it at a proper place. Although you are confused between a few places :-/. Evening is as neat as it was a day before. But the dried clothes have found their place in the wardrobe, and it looks a little messy.. But as long as its not visible to me, its okay! But what about the documents, especially with this friend's calling up, you delay taking out the documents for the next day's morning. You get up a bit early on Wednesday as you have to get those document. You feel proud that your cleaning drive worked well and a hi-five for keeping the documents at the right place. As you check out all the places which could have been one of the proper places for the documents, but you dont find it anywhere. You find it at the most unlikly places, as you had put in a lot of effort to keep those important documents at the right place. Your wardrobe is messed up.. But that is ok, you promise that you will get it back in shape in the evening. In the evening, you realize that your nails are chapped, you try to recollect where did you keep the personal grooming kit. You end up messing the dressing table, throw everything on the table and start working on your nail. You wear a nice nail paint shade.. As the nail paint is wet, you cannot fix the mess tonight. Thursday morning was tasked to fix a bit of the mess that has been created. But you are already running late for work and waiting for the weekend as you need to spend time with yourself. And since the weekend is blocked, you promise to yourself that this evening things would be cleared.. In the evening, no wonder you are tired, and then there is Friday too.. Author's Note: Yes.. I am the you in this post! I reckon that during those growing up times kids had certain set of beliefs, including the concept of oceans (with Shesha Chaturvedi), that breaking promises was a crime.. I wonder, if it were true should you be hanged till dead for not standing upto the mark. I made promise to my room everyday, but I stick to them only on a Sunday, which can anyday takle a backseat dependending on my schedule, however whatever state it is in, I love my room! PPS: Refereing to the question, I will choose the Saturday.. What about you? I hope I stick to a schedule. The frequency of post uploads has gone down though..